What a great day Saturday was! I found time to get two major mods completed and both seem to really help. 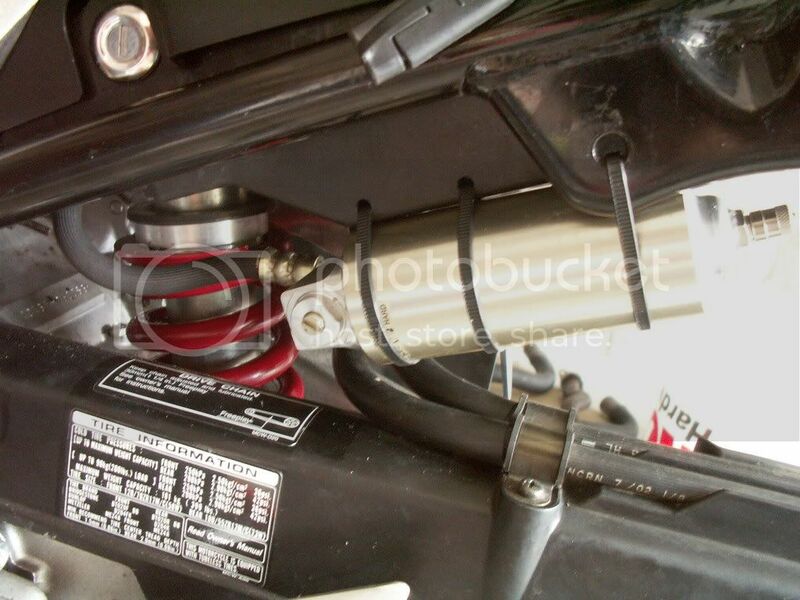 1st, I was able to install an F4 shock in place of the VFR's original. This is EXTEMELY EASY as the shocks are only 1/2" different in total length. I did not have to fabricate any brackets. I did have to drill some holes in the battery box to tie rap the reservoir to, add 1/2" of shim/washers to the top tie to get the height correct, but that was all. The exchange took 20 minutes MAX. One other note is that I did revalve and add a 950 spring to it through aftershock as the original spring was old. 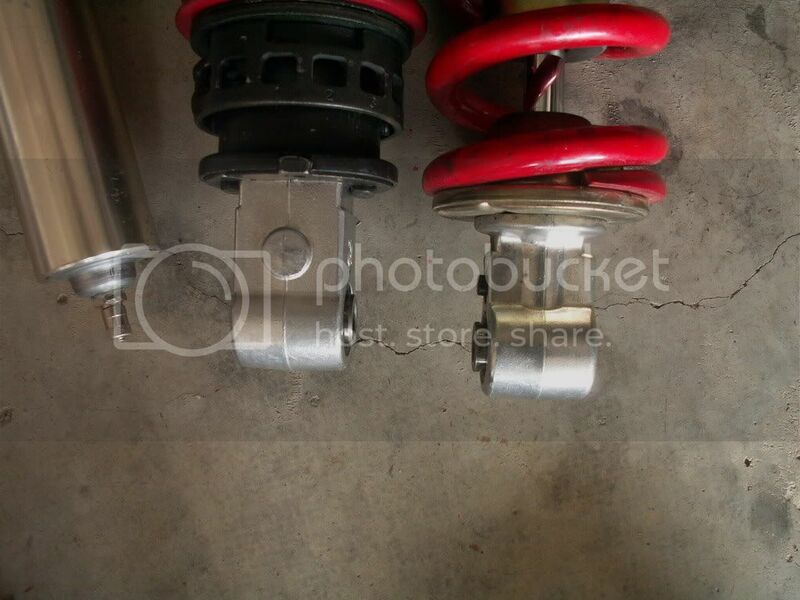 total cost was $40 on ebay for the shock plus $300 to aftershock, or $340 total for a 'internals are new' shock with rebound and compression adjustment. Being that I am 250lbs necked, I really needed a stronger spring and this has fit the bill!! My SAG was 50mm and is now 25mm with more preload left! The bike definitely handles much nicer now and holds the lines in the curve much easier. I was having issues everything feeling loose in turns and I believe it was simply the rear end swaying on the weak (for my wt) spring. All that is gone now. overall length difference of .5"
While I was under there, I threw on a catless header too. I don't notice a lot of volume difference, but I believe I am feeling the front end lift much easier now. I don't have a dyno, so that is my only test at this point. I am still using coyze's map and it seems to be running just fine too. Apparantly, he has developed the super map! 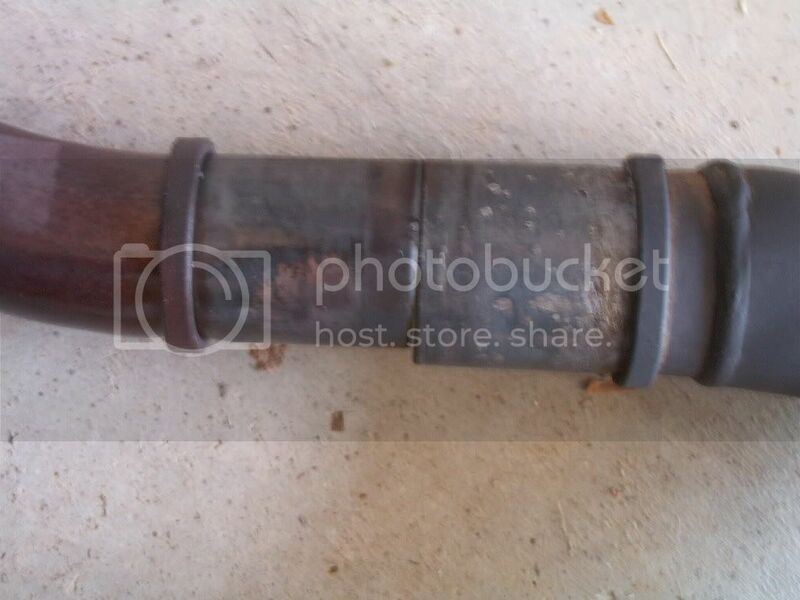 I still plan on gutting my exhaust sometime in the near future and once this is complete, I will try Tinymind's map and see if it runs better/worse on my setup. I also weighed all the parts I have removed and swapped and I am down 20lbs so far on my bike. Not bad! Hey turtle, Welcome to 2003! :P I'm pretty sure I pioneered both of these mods to the VTEC. 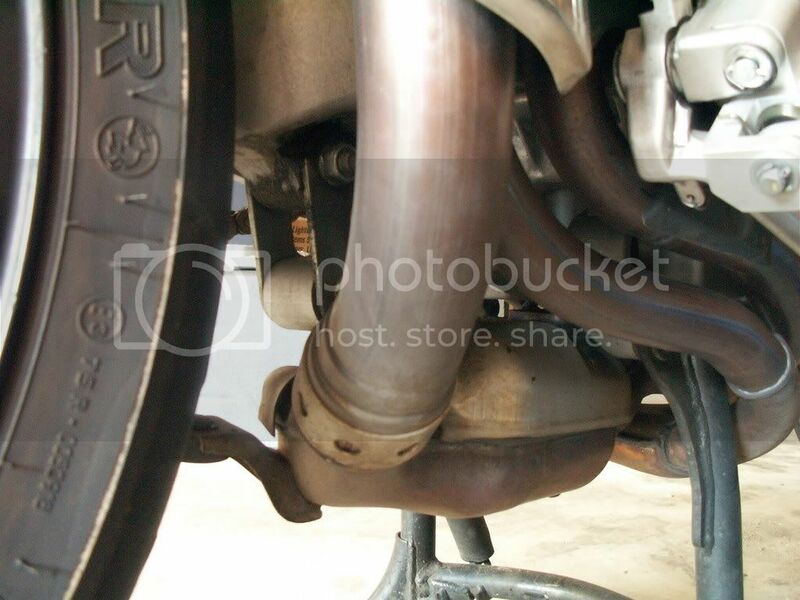 IMHO, the headers are a waste if you don't open the rest of the exhaust. I ran the F4i spring towards the max and I was about 170lbs at the time. You will screw up the handling of the in a major way without compensating for this shorter shock, 5mm is a big change and your talking 12.5mm. If anything you would want a slightly longer shock to improve turn-in, the shorter shock will slow steering a huge amount. You will not like it! didnt you do the same and just make a spacer to compensate for the shorter length? According to the pic, that's not a 1/2 inch difference. Looks to me about 3-4mm which is still too short but if he's been riding it with WAY too much sag all this time, it will still feel better. Throw a couple of washers on the top of the upper bracket and you'll be good to go. Edit: see he's all ready done that. Life will be good. thanks to all the input. u have to love this place as people actually read what you post, and think about issues you might have missed and try to help out! what '-5' doesn't really mean anything. it is just a base line number in 'mm' that i was using to see where i was heading I am actually 8mm biased to the rear from what i 'think' is the factory 'ideal'. not great, i know, but the springs have improved the ride so much i dont care! as you will see, the 'original' condition of the bike with me on it was actually 'close' to what a normal rider sees from the factory regarding front to rear bias. i know someone might mention that 7mm down on front is issue, but unfortunately, i am not sure what to do about it at this time. i may try cutting my spacers in my forks some to see if i can 'unload' the spring some as my adjustment screw is out about 15mm and i still have minimal sag in front. i don't exactly understand this with my weight, but it is what it is. I am thinking of changing my 99 VFR over to the 929 or F4i shocks. Main advantage is compression damping adjustable? The F4i needs heavier springs and revalving but is closer in height, whereas the 929 is shorter but spring is correct weight. I also have an almost new CBR1100xx shock but that looks like the VFR shock, so not worth changing probably. I had a Works Perf shock on the 100xx when I had and it was great but I don't want to spend the $750 on the VFR. I would go with the 929 shock if I were you. You'll get compression damping and you can easily add spacers to make it the right height. The F4i shock would work too, but then you would have to get a new spring for it. Congrats Dale, suspension mods rawk. I recently got a 929 for 5ht gen. Now all I need are new springs & valves for the front and I'll be all set for the Fall meet. so far I gathered from this is that and F4i shock conversion is easier than a 929 shock conversion, and the benefits are similiar. Right? On the issue of spring, could we fit the original 5th gen spring into the F4i shock? This is a Vtec shock option, IMO the 929 shock is the best swap for the 5th gen and has the same spring rate as the VFR. btw the vfr spring will not work on either the F4i or 929 shock. also the cbr 1100xx shock runs a stiffer spring( I think a 17 kg) and with bolt into either, but if I'm not mistaken it's like 1/4" shorter than a 5th gen and 1/4" longer than a 6th gen. and only has the same adjustments as the stock VFR shock. I have a line on a F4i shock for my 5th Gen (2001 model). Will I be able to add shims to adjust for the length difference? And if I do go with the recommendation of some of you, for the CBR 929 shock, would I have to shim the top end? Grateful for inputs, especially from guys that have done this mod. do a search on '929 shock' for other posts. you will have to shim...too much for just a simple stack of washers though. Are the basics the same for a 3rd gen as well? F4i/929?? Come alive THREAD!! The problem I see using these f3/f4 shocks.... found said problem after I ordered 2 of them ... Is that the preload adjuster is at the bottom where you cant adjust it??? Ill be reselling those and install the 929 one. 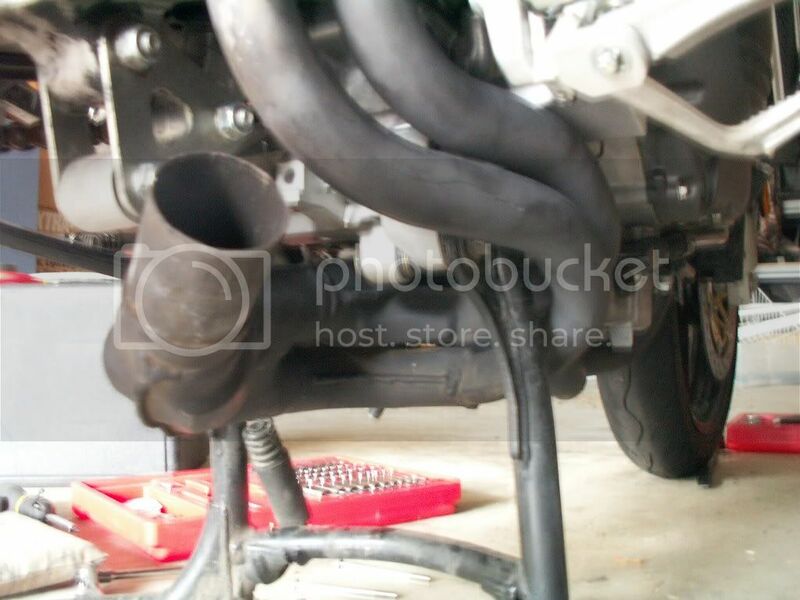 Is the adjuster hidden by the bottom linkage? Is it something else? Also, what is the difference between an F4 shock with red spring and an F4 shock with yellow? if you look at the 1st post pictures, you will see the black adjuster. it is difficult to get to. like you said, if you set it and forget it, fine...otherwise, you might want to consider something else. i have tried to set it with spanner, but haven't spent a lot of time on it and didn't have success. once i get the bike out of my garage (no room to manuever) i'll see if i can do it. In My Garage::2002 VFR800A, 1969 Plymouth Roadrunner, 2001 BMW 325i. I wouldn't recommend using Cozye's map with Catless headers unless you richen the whole map. Cozye's map is much richer than stock, but still probably not rich enough for catless. Tinymind's map is in the download's section. this is a shock thread and that was a random post.....but since you did it....i have run cozye's map for 2 years now....stinks to high heavens because it is VERY rich....no problem running with catless....oh, and she runs like a scalded dog too....i have not tried Jasons, but meant to....having no issues with cozyes, i just never got around to it. Better a little rich than lean. Safer that way and less drivability problems.